Watching TV is not only one of our most treasured pastimes in the US, but it’s something enjoyed all around the world. Whether you’re watching alone, curled up on the couch with your partner, or enjoying some wholesome shows with your whole family, the TV is somewhere that everyone can get together and have some fun. Although the TV is a staple in almost every household, the quality of the picture isn’t always ideal. 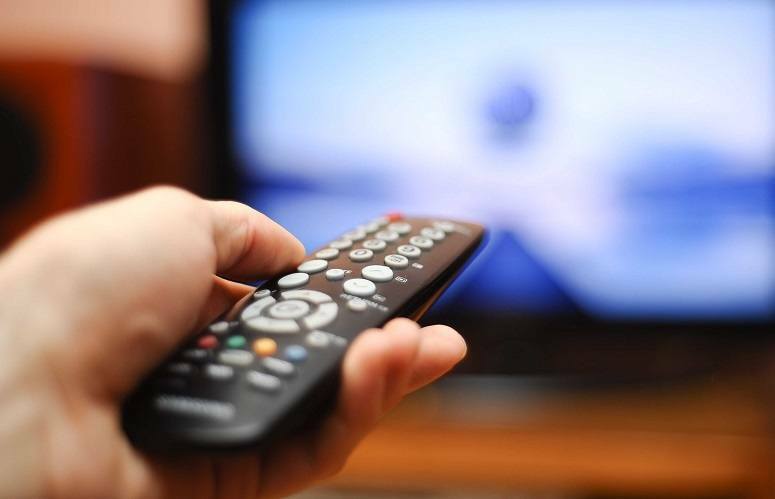 People suffer through subpar quality, not getting the channels they should be able to acquire, and having to get up and down on their roof or outside to adjust the TV antenna just to make the picture work. The rotating antenna is a product designed to fix all of those problems, with an automatic rotation that can be controlled with a remote. Shopping for this simple fix isn’t always as easy though, with many features to consider that could sound like a lot of technical jargon to those who aren’t in the know. This buying guide is the easy way to navigate through all of the products on the market to find the best rotating antenna for your TV. Once done, you’ll have the best home entertainment system possible, access to all of the hottest channels, and a high definition picture that could rival most HDTV cable setups. A TV rotating antenna comes with many features, and depending on your needs at home and the current setup you have, there’s bound to be some more ideal for you. 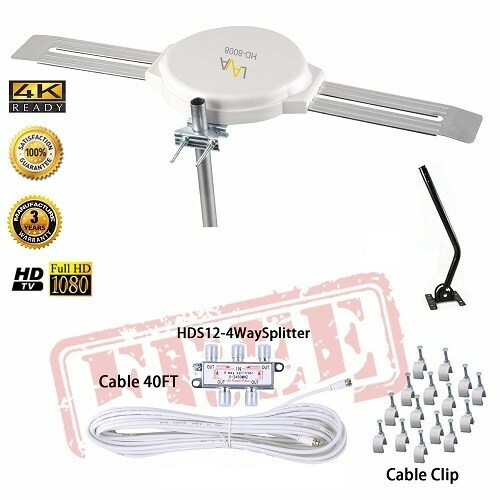 However, our search of the rotating TV antenna reviews has found these to be the best of the best in terms of quality, price, and user-friendliness, so any of them would do your home well. When you’re trying to save money on cable bills but don’t want to miss out on any features that standard rotating antennas come with, the Vansky Outdoor Antenna is the perfect solution. 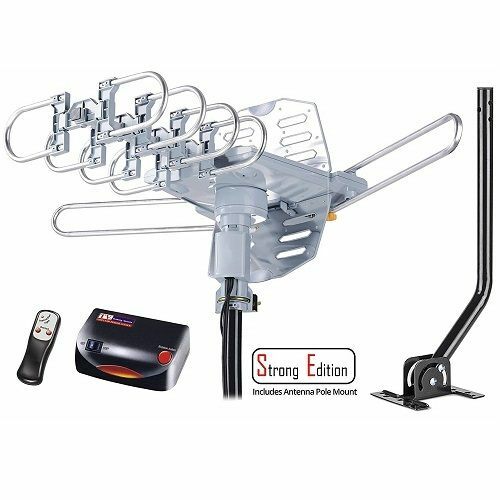 This is the most affordable rotating antenna on the market and it has the quality and key features you need to make it worthwhile. The antenna is also weather resistant and won’t even be damaged by lightning, further showing just how good its quality and construction is. The features on this antenna make it seems like a much more expensive model, and it’s capable of getting 1080p HDTV and 32dB high gain reception. You’ll experience a picture as you’ve never seen before and best of all, it works with two separate TV connections and there’s no need for a splitter. Vansky has saved some costs for customers by not attaching a pole, so you will need to spend a few dollars more to get some PVC pipe for installation. This could put some people off, but it ends up saving you a lot of money in the long run, so if cost-cutting is important to you then you’ll want to consider it. Another point to consider is that customers weren’t all too happy with the coax cable that came in this package from Vansky. Some people replaced theirs instantly and others tried to make it work first, so give yours a chance to see how it performs. Replacing his cable will only cost a few dollars, but it does make it more work and more money overall so it’s something to keep in mind. One saving feature of this rotating antenna is the remote that comes with it. This means no more heading outside to make adjustments or wondering how to get a better picture, as you can control it all from your remote. It’s completely wireless and controls the 360-degree motor rotor on the antenna, so you get full range and up to 150 miles of coverage. Just because the cost is low for this antenna it doesn’t mean it can’t perform. You’ll get a 150-mile radius that picks up any and every channel in the area, delivering you high definition TV without having to pay an extra cent for it. 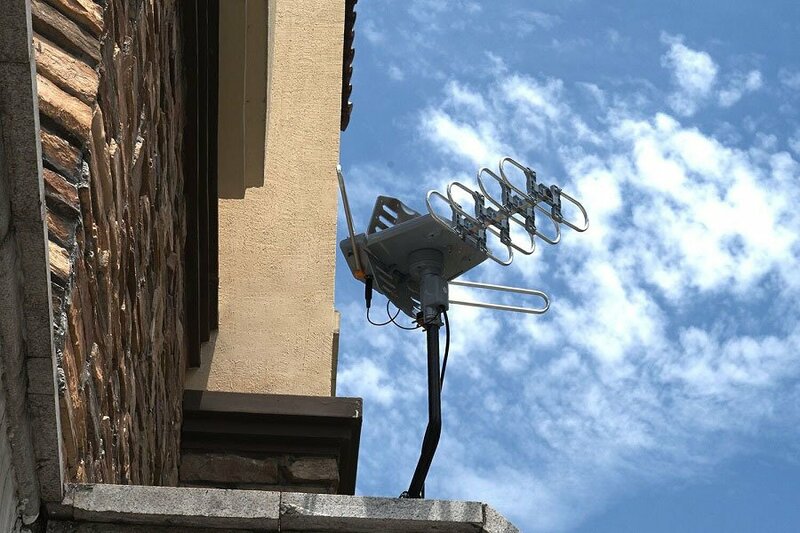 When compared to the ongoing cost of cable or subscription streaming services, you’ll potentially save hundreds of dollars a month using this rotating outdoor TV antenna. When you’re looking for a rotating digital TV antenna but know that your handyman skills aren’t exactly up to par, something like the PingBingDing Rotating Antenna is your best option. This is one of the easiest on the market to install, and although it costs a little extra compared to the competitors, you won’t have to do much to get it working. The setup of the PingBingDing Rotating Antenna is done with a snap-on installation. You’ll get a detailed user manual with your antenna and it can be fully installed without any tools. This is ideal for people who are worried about the installation process or those who’d prefer not to buy any extra parts just to get their antenna to work. It’s hard to say whether it was the fault of the antenna though and not some other obstruction or issue that’s occurring in their area, as there are plenty of happy customers who loved the channel range it had. The PingBingDing Rotating Antenna has been built to be completely weather resistant so that even when the worst weather comes rolling in you won’t lose any signal. The lightning protection on the antenna also gives you peace of mind, as this is one of the biggest issues when looking for a quality outdoor antenna. 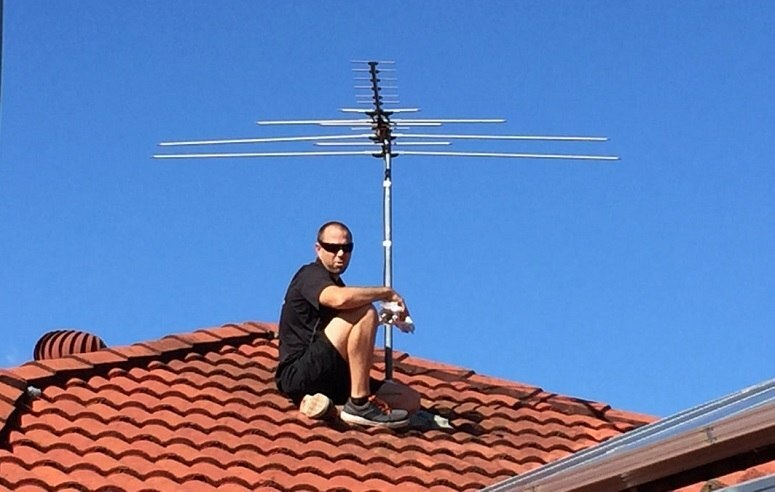 As long as you’re careful during installation, it seems this antenna has been built to last and will serve you well on the rooftop for many years. What makes this such a cool product is its wireless remote controller which comes standard with the better brands of rotating TV antennas. It has a 360-degree motor rotor in its design so it can move seamlessly around to get you the best reception. You’ll also get all of the parts needed like a coaxial cable and power supply adaptor which all appear to be great quality. This antenna seems to compare quite well to others in its price range, with the notable difference being the easy installation. If you favor this over the possibility of missing out on a few channels, you’ll be thrilled with all of the features that PingBingDing Rotating Antenna has to offer and will notice an instant improvement to your TV picture quality. If money is no object and your main priority is getting the very best resolution for your TV, you’ll want to check out the Lava Omnidirectional TV Antenna. Priced at around double what our other recommendations cost, you have to be prepared to spend big if you want this type of quality for your picture. The Lava Omnidirectional TV Antenna works as an omnidirectional device which means it can collect signals from both directions without needing to be adjusted. 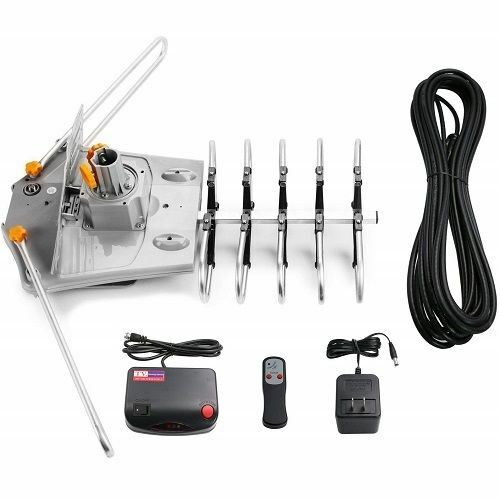 This means that once you’ve placed the long range antenna on your roof or wherever else you wanted it, you’ll be able to sit back and enjoy the results without lifting a finger again. This antenna has a built-in dipole that’s capable of getting digital channels, as well as both UHF and VHF reception. One issue with this antenna is that it will only work for those with some distance between their homes and the tower. Because it’s a long range device, if you live too close to the tower you’ll find it overshoots and will also have to invest in an indoor antenna. Lava has added everything you need to get this set up at home, and you can choose either a wall mount or pole mount. There’s an installation kit that includes a four-way splitter so more TVs can watch at once, a 40ft coax cable, and 15 cable clips that will be more than enough to set it all up. Some of the online customers claim to have spent over half an hour trying to install this so give yourself some time to get it right. Although this is meant to be an omnidirectional antenna, some of the reviews claim they had to adjust it every now and then to get the signal back. When you’re paying this price for the privilege of an omnidirectional device, this isn’t really something you want to be doing, so a rotating remote controlled one might be a better option. This is a great choice for homes that have a little further space between them and their tower, with a range of up to 130 miles. Lava recommends a range of 40-80 miles for the best results, so if this sounds like your area then you’ll no doubt get the best quality and better range of channels to choose from. Rather than throwing away thousands of dollars on a new television, you can get better results by simply buying a new antenna. Choosing an antenna is no easy feat though, and there are plenty of features you’ll have to wrap your head around to understand. 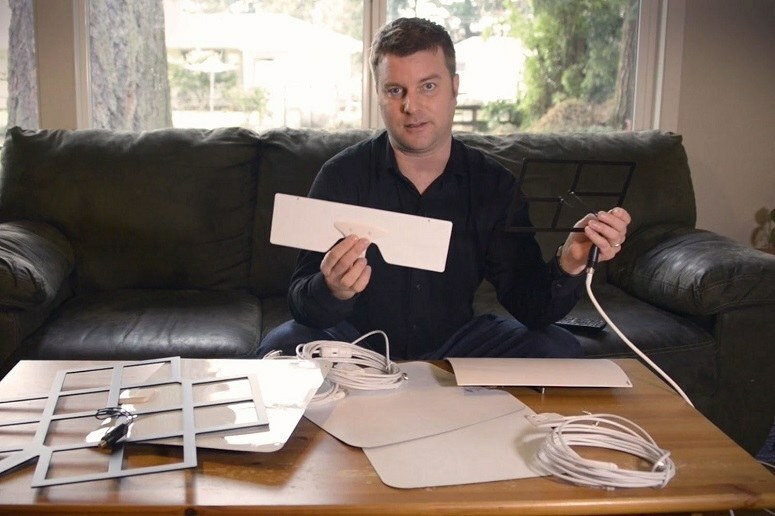 Here are some things you might want to keep on mind when you’re searching for a TV antenna and what they mean to the final product. This could either be a small or big deal for you, and those who feel they’re a little more mechanically minded won’t care about the installation effort. There are some simple snap together antennas that suit those who want things easier, but you have to be prepared to pay for the pleasure. Most modern rotating antennas come with many options for frequency support including digital, UHF, and VHF, with some even having more than this. The range and frequency you require will depend on your location and what other preferences you have. Rotating antennas are usually operational with a remote, so look for this feature to save yourself the hassle of manually adjusting it when you need a better picture. A directional antenna faces just one way whereas omnidirectional devices go both ways. These are designed to pick up a clear picture without you having to make adjustments. Any outdoor antenna needs to withstand the elements, and an added bonus if it’s lightning resistant for safety. The warranty period will depend on the manufacturer and the cost of the antenna, but you’ll want at least 30 days to ensure that it works at picking up a signal at your home. With so many Americans making the smart decision to cut the cord, we need all the help we can get to achieve high definition TV and a greater range of free channels. These days, there’s no need to spend hundreds of dollars a month for a cable or satellite subscription especially when you can get the high definition look that these antennas can achieve. Shopping for a rotating antenna is a cheaper option than buying a new TV, and will get you better results. Even with a modern high definition TV, if you don’t have the signal strength that these antennas are capable of you won’t be able to watch anything worthwhile on it anyway. We’ve found you some of the best rotating TV antenna options on the market, so all that’s left to do is choose one that suits your home entertainment setup. With the addition of this one simple device, you’ll never need to pay a cent for pay TV services again, and will enjoy the greatness that free, high definition broadcasting has to offer.